Over the past few years, the popularity and types of specialized hobby cameras has exploded. At the top of the heap are drones, the common name for Unmanned Aerial Vehicles (UAVs). Drones give a new, god’s eye perspective on everything from nature hikes, to real estate, to kids’ soccer games, to being out on the water and more. With drone costs coming down and feature sets and choices going up, many are considering drone ownership. But some give pause because they fear the complexity or just don’t know if it's the right thing for them. That’s where DroneNerds come in. The love of their business can be traced to their son, Nicholas. Nicholas used drones while he was finishing film school. Friends and family always asked him to create drone footage for their events or projects and when the rest of the family got involved in turning that into a small service business, the love relationship flourished. The store was a natural extension, bringing retail sales and all the services together. If you are at all hesitant, the friendly staff will do more than just sell you a drone. They’ll take you outside and hand you the controls so you really get comfortable before you dive in. They educate and inform as part of every sale. If you want more support, a $99 post-purchase one-hour class will get you complete set-up and a guided first flight. Thereafter, you can come to the store unlimited times for further educational help. They are just about to launch evening classes with professional UAV pilots who will teach you the art of getting amazing images. 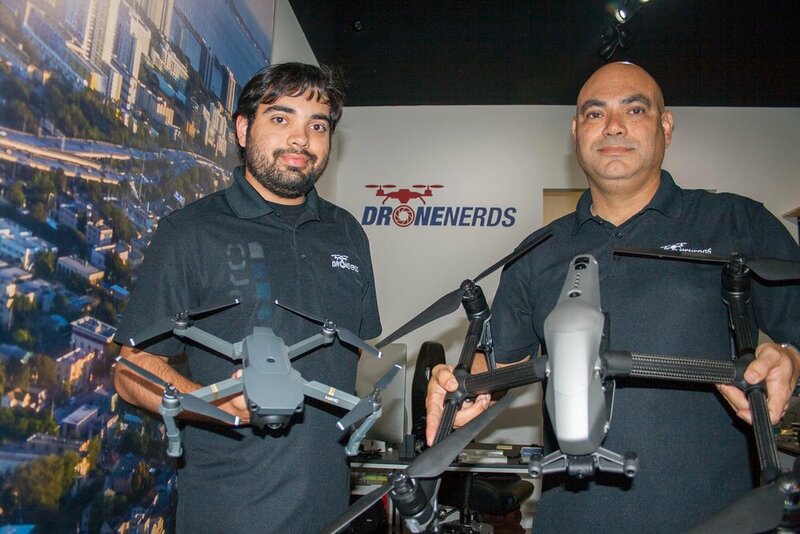 Besides DroneNerds being the largest UAV dealer in the United States, it is DJI's largest and most experienced authorized service center as well. I tested their repair service with my crashed Phantom 3 drone. Typically within a week (rush service is available at a cost), DroneNerds of Pinecrest will diagnose most any drone (starting at $60) and then if the customer chooses to do the repair they’ll apply the diagnostic fee to the cost of repair. I took in my drone which had crashed, leaving the outer shell looking quite ragged. Within days, I got it back looking shiny and new. The cost was quite reasonable and the repairs are done right in the store, so you can always get status easily. If purchase isn’t your thing, their aerial division can be hired to shoot drone photos or video. They really are ‘all things drone’. DroneNerds of Pinecrest also sells GoPro cameras and other hobby cams. Give them a visit if you have anyone “nerdy” on your holiday shopping list. They are located at 9075 South Dixie Highway in the shopping plaza with Moe’s and T-Mobile. You can call the store at 786-313-3664 or go to dronenerds.com/pinecrest for more information.